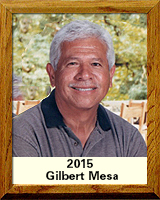 Gilbert Mesa was a student-athlete in a variety of sports throughout his high school and college career. While attending Pueblo High School, he played football, basketball and his love, baseball. He played for the likes of Lou Farber, Ed Brown, John Nichols, Jim Ferguson and “El Indio” Jim Estrada. In 1964, Mesa was the 1st freshman in Pueblo history to throw a no-hitter, which enabled him to be inducted into the Pueblo Hall of Fame as a senior in 1967. In 1967, he also earned All-City (Tucson) and Honorable Mention All-State honors in baseball. Mesa’s baseball talents earned him a full ride athletic scholarship to Eastern Arizona College where he was a two-year starter for Charles LaVetter. In 1974 while attending Pima Community College he assisted Rich Alday in implementing their baseball program. He graduated from Pima and the University of Arizona with degrees in education. Mesa’s high school coaching career began at Clifton where he stayed 30 years, having a .714 winning average and leading the Trojans to 315 victories. His teams won 12 conference championships while qualifying for 12 state playoff appearances garnering two state runners up trophies. Mesa also coached summer American Legion baseball with the likes of Frank Trujillo and Oscar Romero, winning numerous district, state and region titles. He has received many accolades in baseball from conference, state and national associations, being named coach of the year many times and coaching in numerous All-star games. Mesa’s biggest honors have been being inducted into the Pueblo and Arizona baseball Coaches Hall’s of Fame. Recently, he was honored by having the baseball stadium in Clifton named after him for his dedicated service to the Clifton community and to baseball.